← When You’re Lost, Do You Stress or Stay Serene? And What’s the Message? Last year, soon after my step-son had just been diagnosed with Stage Four non-Hodgkin’s Lymphoma, I went with him for one of his treatments at the hospital near Tel Aviv. Nadav has lived me with me on and off since he was eight years old; he’s thirty-one now. As we were waiting for his medicine, my unofficially adopted daughter from Ethiopia, came into the room. The nurse, preparing Nadav’s medications, looked up. She’d already witnessed a parade of visitors: Nadav’s mother, father, friends, along with five siblings from our blended family. “And who’s this?” the nurse asked. Growing up with only one sister next to the McCarthy clan of eight on Long Island, I’d always dreamed of having a large family. Although I counted myself among the first generation of young feminists (I took one of the first women’s studies courses at Cornell, when our only textbook was a battered paperback copy of Sisterhood is Powerful) I still wanted to get married, have children. Some of my friends preferred to concentrate on their careers and gasped in wide-eyed astonishment as I popped out four kids in six years. Naively, over-optimistically, unrealistically, I assumed I could do it all: juggle my writing career and kids while still making my own granola and baking bread. After my first marriage crumbled, I married Jonny who had two of his own kids, upping my maternal responsibilities to six children, all under the age of eleven. Then, a friend told us about a young Ethiopian woman working in his office. He said that Degetu came in to work wearing the same shirt and pants day after day after day. He asked Jonny and me if we could help her. We agreed; but we didn’t want to only help her financially: we wanted to be part of her life and to have her be part of ours. After all, once you’re dealing with six, what’s one more kid? I’ve always tried to practice what I preached at my bat mitzvah, which was the idea of tikkun olam, repairing the world. There’s a Jewish saying, If you save one life, you save the world, and I believed that to be true. Degetu was born in a birthing hut somewhere in Gondar Province, Ethiopia. She isn’t exactly sure of her birthday; her passport still reads 00/00/0000, but her mother remembers it was during Ethiopian President Mengistu Mariam’s Red Terror Campaign in the early 1980s. In the middle of one dark night, she, her parents, and her eight brothers and sisters were airlifted to Israel along with about six thousand other Jews during Operation Moses. Her father was the religious chief of their village and her mother had a royal, regal posture and tattoos decorating her jawline, but once they got to Israel, they were faced with modernity, baffling and fast-paced and alarming. They took it as an honor that Jonny and I, complete strangers, would be willing to take in Degetu and help her. When she was growing up in Ethiopia, she knew when to leave for school by the way the shadows fell off the trees. She didn’t make it past third grade because she was sent to live with an aunt in another village, carrying water from a distant stream and tending her aunt’s herd of goats, a barefoot shepherd. Then she got to Israel, where she had to make up a decade of’ worth of education at lightning speed. She has stayed with us often, including one summer when she did an intensive English course, all the while asking me questions. How do garage doors automatically open? How can you freeze food for weeks? How can a man say he loves you and wants to marry you, but then dumps you, and continues on his merry way without community reprisal? Ah, welcome to the western world. 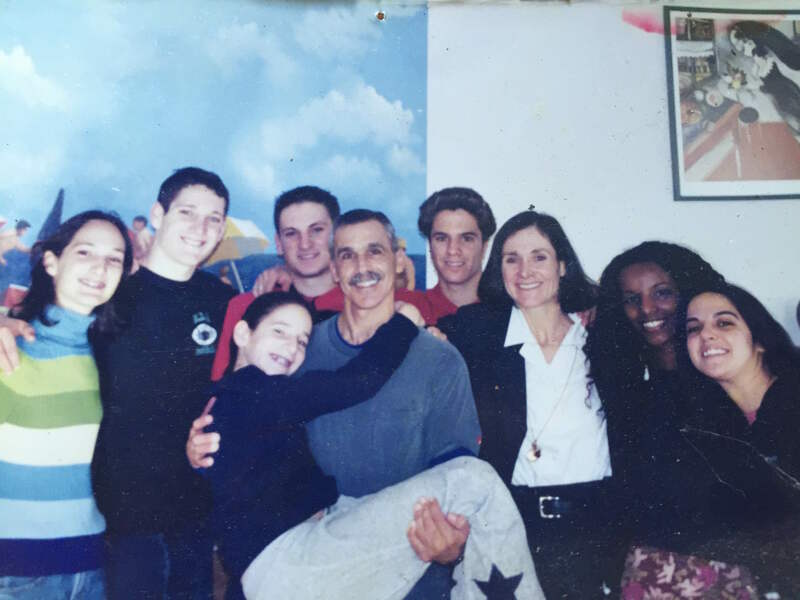 In 2000, soon after Nadav met Degetu, he flew with her from Israel to New York to meet the rest of the family. Degetu said she felt like she’d won a lottery, and kept pinching herself to make sure it wasn’t a dream. Since it was her first commercial flight, Nadav showed her how to buckle in her seat belt and watch a movie and bought her first bottle of perfume at the Duty Free Shop. Since then, she has learned computer programming, got a job working in computer security at a bank, married, and had two children of her own. Somehow, it all sorted out as the kids grew up, and grew to love one another. I kept telling myself that the people who came into my life were there for an important reason. I was always ready to learn new spiritual lessons. Life kept taking us on new and unexpected twists and turns; and once again, I was faced with teaching our kids how to bend, not break. Especially now. Now that Nadav was fighting this cancer that threatened his life. All the tough moments of the past automatically forgotten, to be replaced by more important memories. After Nadav’s treatment, Degetu and I walked him slowly out of the hospital and then we all went to eat gelato at a nearby ice cream shop. Sitting there, I realized that we were an odd trio, these two young adults and me, brought together by luck or fate or something grand, mysterious, inexplicable. I was thankful we’d made it this far. Grateful we were doing this thing called life, together. I felt proud of them right then, fiercely protective and ultimately powerless. In other words, maternal. And that was when I had this startling discovery. Sometimes, the kids who make us feel the most like mothers are the ones who aren’t even our own. This entry was posted in Acceptance and tagged Ethiopian Jews, Family, Israel, miracles, mother, Mother's Day. Bookmark the permalink. I Happy belated Mother’s Day Diana. Thank you for sharing this part of your life. You have a wonderful heart which God has used to bless others. I so enjoyed reading Degetu’s story. I pray for Nadav daily. I wore the T shirt Jonny sent me yesterday. I hope he received my email thanking him. It is my favorite shirt. Keep writing Diana. Keep sharing your heart. Ah, all the great lessons I have learned from you. The Wonder Woman of human measure knows no bounds. You are a bright light onto all of your children and your nations. Wonder woman! Me and Gal Gadot! How beautiful and so accurate! The Best Chapter is recognizing and appreciating the moments that matter the most. Thank you! Gotta keep exercising the heart, too, right? what a beautifully written, touching piece this is Diana. And, I agree with all those loving comments that have been posted by others. You truly are blessing to all who know you, especially to me. Thank you, Jackie. You are one of my role models!